The costume designer dresses somebody from the inside out. We care about what kind of underwear they’re wearing. It’s really important when you’re dressing somebody for a film to kind of think about what they’re wearing after they take their shower; what’s the process; what goes on underneath; what makes sense. And it’s a real internal process. The process of fashion is completely external. It’s disposable. It’s changeable. Debra McGuire, Hollywood costume designer. Ms. McGuire is the go-to costume designer for television. Most recently she has designed for Fresh off the Boat, New Girl, and Speechless. From 1994-2004 her main designing gig was Friends. She has worked on many a film as well. including Knocked Up and Righteous Kill. The reason that I am a costume designer is because it is everything that I am interested in, and did on my own as a kid, all put into one job. There’s the drawing and painting of sketches. There’s the fascination with the history of clothes. I was always into fabrics. Costume design is giving an external look to a character. It gives an indication of things unsaid. Mark Bridges, American costume designer. Congratulations to Mr. Bridges for his Oscar win last night – Best Costume Design, Phantom Thread. What a costume designer does is a cross between magic and camouflage. 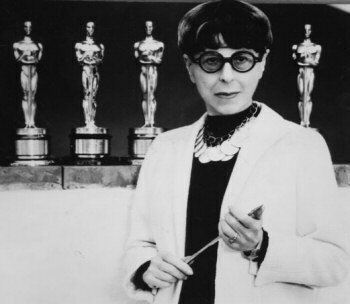 Edith Head (1897-1981), Hollywood costume designer.